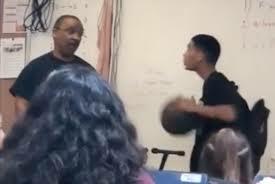 Viral video of a Los Angeles music teacher beating an alleged racist student to the ground has divided the community as parents chastise the teacher - Marston Riley who got arrested after serving the beatdown, community members took it a step further in support of Riley having reportedly raised $100,000. after setting up a Go-Fund-Me. The Gofundme page was set up with a goal of $30,000 for Marston Riley, a music teacher at Maywood Academy High School, but as at Tuesday, the donations surpassed the original goal.